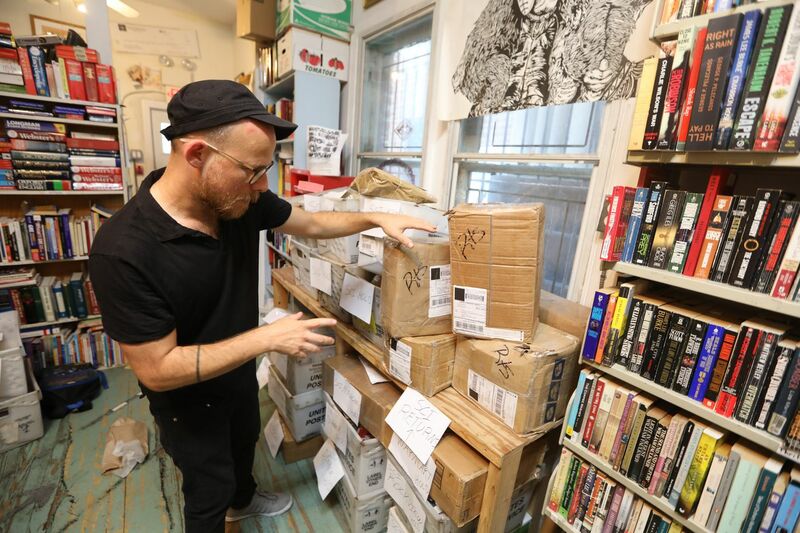 Keir Neuringer, a member of Philadelphia’s Books Through Bars collective, sorts through packages of books that were supposed to go out to Pennsylvania prison inmates but were held back in September, 2018, after the Department of Corrections stopped allowing direct book donations. Forty-five days after launching a slew of unprecedented and controversial security measures across state prisons, the Pennsylvania Department of Corrections is calling the initiative a success: The number of drug finds, inmates' positive drug tests, and misconducts written for drug-related activity all were cut in half or close to it. The department also credited the new security protocols with a slight decline in the number of assaults in prisons. The department also announced a number of new policies meant to answer criticisms by advocates, inmates, and families, who have railed against measures like the elimination of direct book purchases and book donations to inmates, a procedure that provides inmates with photocopies of their legal mail rather than the originals, and a $15.8 million, three-year, no-bid emergency contract to divert all other inmate mail to a company in Florida to be scanned and digitally forwarded. Among those solutions: free dictionaries for every inmate who wants one, paid for out of funds collected from inmate purchases; a new secure email system for legal mail; and a centralized book-donation hub. "One of the most-discussed policies is mail, especially books," Corrections Secretary John Wetzel said Friday in a statement. "We hear what inmates, advocates, and families are saying; we listened, and are addressing those concerns." Advocates, though, are not impressed with the preliminary plan — and a representative of Books Through Bars, the Philadelphia-based book-donation program, said it would not participate. Bret Grote, a lawyer with the Abolitionist Law Center — which along with the Pennsylvania ACLU and the Pennsylvania Institutional Law Project has warned the department of a likely federal lawsuit over the legal mail policy — called the notion of a secure legal email service "an outrage." He said it comes no closer to protecting attorney-client privilege than the policy of photocopying inmate mail. "The Department of Corrections needs to stop restricting our ability to use the mail to communicate with our clients," he said. "The DOC acknowledges they have zero evidence any attorneys are attempting to send in contraband via legal mail, and if any individual attorney were to do that, then that individual should be held to account. An email system is not adequately secured. Attorneys should never be in a position where all of our communications with our clients are being run through a digital platform controlled by the government and, in many cases, our adversaries in court." He referenced reports from a few years ago that Securus — the company with the Pennsylvania prisons phone contract — recorded supposedly confidential attorney-client phone calls, and that those recordings were exposed in a massive data breach. Securus denied that there was any evidence privileged communications were recorded. The department also reported a decline in staff illnesses related to exposure to synthetic cannabinoids since the security measures began. Experts in medical toxicology, as well as some emergency-department directors at Pennsylvania hospitals where the staff were treated, argued such exposures are improbable. They suggested those illness were likely triggered by anxiety rather than by any toxic exposure. The DOC released a report to show its policies to stop drugs from entering state prisons are working. Keir Neuringer, a member of Books Through Bars, said he would likely not participate in a DOC-run book donation program, in which the Department would gather inmates' requests by genre and then send them to donation programs to be fulfilled. "We're not volunteering to work for the DOC for free," he said. And, he said, a request for a genre, like black history, is not the same as a letter from an inmate that articulates a specific area of interest, like memoirs by 1960s civil rights leaders. "We scrutinize these letters. We're trying to help people further their transformation, not just fill in these requests in a kind of meaningless way, which is what the DOC's proposed solution looks like. … It cuts off our communication with incarcerated people. And that is a violation of our First Amendment right and that won't stand." He added that there's a reason dictionaries are the most-requested book: the dictionaries the DOC offers through the commissary are insufficient. "'I need a dictionary that has more words' — that's common refrain," he said. Above all, though, critics are not convinced that these measures were necessary in the first place. "These books-to-prisoners programs provide a great service and they're run by caring volunteers," Sean Damon of the Amistad Law Project, which has helped organize families against the new policies. "The DOC has conducted no investigation and provided no proof that staff were exposed to any substances through these book-donation programs."